Having studied our lore for quite some time now, I have recently become fascinated with minor and regional Gods and Goddesses, mainly those that have not been given overly attention by any of the Sagas. With another Yule having drawn by, I decided to devote some study to one of the Goddesses connected to this time of year, more specifically one who was worshipped mainly among the tribes of nowadays Germany, and part of whose memory is preserved until present day in the folklore of Germany, Switzerland and my native Austria: Holda. First, one should maybe consider Holda’s position in our mythology, one that is not trivial at all, and in fact very complex and even complicated. Holda is preserved in many folktales, where she has been given a variety of names such as Holde (which stands for “merciful”), Perchta, Berta (“Bright”), Frau Freke, Frau Gode and most famously so, Frau Holle. Notable is maybe that both the name Frau Freke and the theme that surrounds her are closely related to the myth surrounding the Norse Goddess Frigg; and since the information about Frigg, by reference to various sources of Teutonic mythology is rather limited and scarce, the myth and tradition in honour of Holda could be vital in reconstructing the position of Frigg in our lore, and more importantly, the position she had in the daily lives of our ancestors. Going into more detail here, we will realize that this correlation with Frigg is not on grounds of a single occurrence, but that similarities are apparent throughout the sources we can rely on. As such, a further indication that Frigg and Holda could be two names for the same person can be found in a name she has been given, “Frau Gode”. It is probable that this is related to Odin, who in German regions is called Wotan, and whose name in the old proto-Germanic language, Wodanaz. Indeed, there was a shift in sound from W to G in German in the early medieval, which has also left many place names with the prefix Gode-; most famously so, Bad Godesberg, which is now part of Bonn, Germany.1 Mrs. Gode would thus be Odin’s wife by logic – which again suggests a synonymous nature to Frigg. Another clue may be that in several local legends, Holda is presented as a Goddess of Healing, and is equalled to the Earth-Goddess Nerthus, who in other regions is referred to as Hludana or Hlodyn; the latter name being used in Stanza 51 of the Voluspa for Thor’s mother. This particular link is based upon the assumption that Nerthus and Frigg might also be of a synonymous nature, a topic which this article will not deal with overly, as William P. Reaves has sufficiently done so in his article “Nerthus: Toward an Identification”. 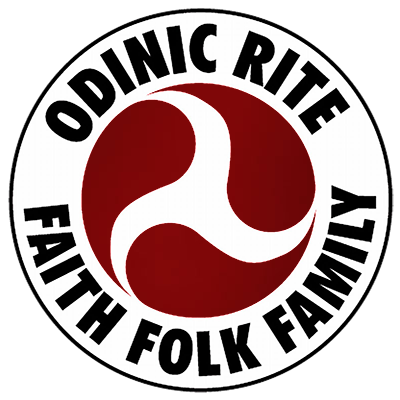 Indeed, several names for a specific deity seem to be quite commonplace in Germanic mythology – Odin alone has at over fifty2, and his son Thor has among others the following names: Asa-Thor, Oku-Thor and Wingthor. Holda is also preserved to a great extent in German folklore. The most famous folktale about her was written down in the early 19th century CE, by the Brothers Grimm. Here she is referred to as “Frau Holle”. She has the role of both a good grandmother (to the girl who helps wilfully) and a hag (to the girl’s lazy half-sister who refuses to be of any help). On the surface, this seems to be merely a story of morals, but it reminds of the celebration of Christmas (thus, Yule): She rewards those who have been good, but punishes those who have been bad. A further indication of her as a Yule goddess can be found in the idea that “when Frau Holle makes her bed, it snows”. Needless to say, snow is a sign of winter, which is the season in whose midst we celebrate Yule. Also, some of her names are linked very closely to light, especially Perchta and Berta. Again this suggests the time of Yule – as it is indeed the time of year when we celebrate the return of the sun. The idea of her being a Yule goddess is reinforced in many folkish traditions. Again, I will explain this at a later stage. What may also be of interest is the way she is portrayed. She is sometimes referred to as a Goddess of beauty (which could, however, be rooted in the fact that the name of Frigg – Frija – and the name of Freya – Freyja – are often confused), yet sometimes as an old hag. The “hag” part may however be a later, Christian, infusion. Thus, we are left with the idea that she is a Goddess of beauty and also an old woman – a concept that appears very alien to the time we live in, where the words “youth” and “beauty” are often used interchangeably. Yet, this serves as an indication that older women – and old people in general – were respected a lot more than sadly is the case today. Nevertheless, what almost all of the legends agree upon is her portrait as a spinstress. This idea is most famously reinforced in the popular Yuletide story, Die Blaue Blume. Here she appears as the guardian of a cave – a cave which appears in a number of local German folktales as the habitat of Holda, and which is generally conceived to be the one of the caves of the Hoher Meißner mountain in Hessen, Germany. In this story a man enters her cave by coincidence, while he is in pursuit of escaped cattle. The woman who lives in the cave offers him to choose among all of her treasures, and he picks a bunch of blue flowers, despite the abundance of jewels and diamonds. These flowers then multiply in his garden the following spring; and as a reward, the woman pays the man and his wife a visit. During that time she shows them how to spin flax from them. Furthermore, a number of sources, mention her as a patroness of all women and children – which again contributes to the idea that there is at least a connection, if not a correspondence to Frigg. Interestingly enough, while most of the gods are only known to us from the lore that is preserved, traditions devoted to Holda were continued even after our ancestors where Christianized; and some of these traditions are conducted up to the modern day. In previous times (and still today in some rural societies) a bowl of milk was set upon the table on “Christmas Day” and is left there while the family went to the mass. This was to symbolize the fertility that Holda’s name is connected with. It is also known that youths dressed up and carried a large image of a goddess figure through the village as the part of a happy procession. The tradition appears to be based upon the myth of the Holdafolk. These are mountain spirits that wander about the forest, the hills and the highlands. They are rather small, and quite fair, but often have a deformity, such as a hollow back or a tail. They are generally conceived to be well wishing, but as the tales have it, they need to be approached with some caution, just like any other spirits one might meet along the road. It remains however possible that these were seen to be an “army” of ancestral spirits – as it is widely known that Yule, among other things, is a time where the connection to the ancestral spirits is particularly close. with these “devils” as protagonists – and of course, both ancestral spirits, and fair but deformed creatures as remnants of heathen times would have been seen as such in Christian society. To be afraid of any kind of wight travelling about indeed seems to be a motive that was quite common to the time – one may just refer to the reactions of the people regarding the repeated hauntings that occur in Eyrbyggja Saga. Furthermore we can also suggest that once our Folk was Christianized that the practice, otherwise also known as the “Wild Hunt”, was extended to include other creatures that were feared. It is even possible that Holda herself, as a heathen goddess was seen as a demon. However, we can only assume the wider reasons behind this ancient and extensive custom; and to deal with them in brief would hardly do them the justice that is due. Finally, in regards to traditions, we realize that Holda had the twelfth night of Yule allocated to her. Interestingly enough, in Old High German, the name of this night is perahtun naht – meaning “the luminous night”. The connection both to the goddess (as another name for her is “Perchta”) and the general idea of the celebration of Yule can hardly be a coincidence. On a last note, one may find interest in her connection to the Elder Tree. It has been mentioned beforehand that a number of sources deal with her as a goddess of healing. Indeed, the Elder Tree can be said to be connected to Holda – not at last because of its Old High German name holanthar; and even its modern German name Holunder (or Holler) bears some resemblance. Elder was held as a sacred tree and could not be cut without a prayer, and was furthermore not sown but left to grow on its own. Most importantly however, it is still used as a vital ingredient in the natural medical recipes of many areas of Germany, Austria and Switzerland. 1 It gained historical importance, as it was the town were the second meeting of Mr. Chamberlain and Herr Hitler, was held, in regards to the annexation of the Sudetenland, in late 1938 CE. 2 For a comprehensive list, see Grímnismál, stanzas 47-51, 55; Gylfaginning 3, 19; to a lesser extent Skaldskaparmal. 3 Of course our Yule starts a little earlier, but both the duration of the festival and the approximate time of celebration are in correspondence. – “The Prose Edda”, by Snorri Sturluson; Jesse Byock (translator), Penguin Classics.